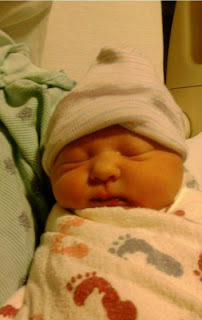 Mom, Alyce, Luke, and myself would like to welcome to the world our neighbor's Jeff and Liz's new baby Abigail. Liz announced she was pregnant just about the same time we brought Luke home from the hospital. Here we are 9 months later and they have their own bundle of joy. Abigail was born 6 lbs. 7 oz. with a length of 18 in. Alyce and Luke haven't seen her yet. We didn't want to bring our germ infested children into a clean environment and we wanted to have uninterrupted time holding such a cute little girl.